Mix butter, tomatoes, olives, capers, orange peel, orange juice, and rosemary in small bowl. Reserve. Pat fish dry. Season with salt and pepper. Coat lightly with flour, shaking off excess. Heat oil in Presto® 11- or 12-inch Electric Skillet at 350°. Add fish; cook until golden, about 4 to 5 minutes, turning once halfway through cooking. 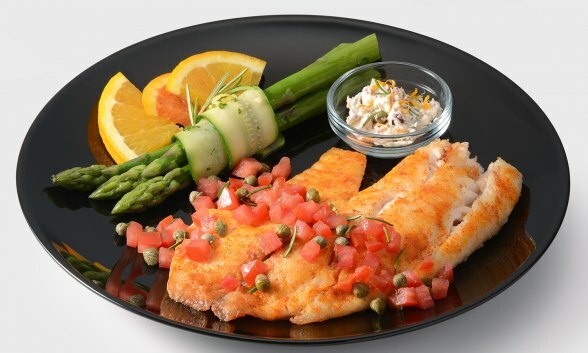 Serve flavored butter over fish. Flavored butter may be shaped into a log and frozen for up to 3 months.